According to a recent renter survey, 75 percent of tenants say they are pet owners, compared to 43 percent in 2012. These findings, compiled by Apartments.com, a leading Internet apartment listing service, align with the improving U.S. economy; according to an American Veterinary Medical Association survey released last year, the difficult economy played a very strong role in the first decline in pet ownership since 1991. Even those who don’t keep pets are pet-friendly. According to the survey, 60 percent of renters said they still enjoy living around others with pets. Landlords in general appear to be getting the message. “Nearly 80% of our survey respondents live in a pet-friendly building, indicating both landlords and residents without pets are increasingly recognizing that pet owners are, for the most part, responsible and respectful neighbors,” said Tammy Kotula , public relations and promotions manager, Apartments.com. However, more than 60% of renters surveyed also said they faced some level of difficulty in finding accommodations for pets. Renters can tailor apartment search results on websites like Apartments.com to only show apartments that allow pets. 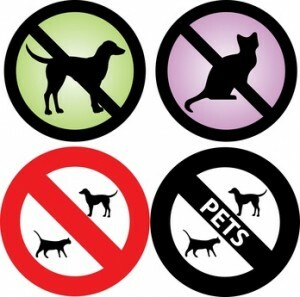 “Understandably, nearly all pet owners surveyed said pet policies play a major role in their decision of where to live. Clearly, pets are a deal breaker for many, and apartment buildings with more flexible pet policies will be the ones to attract this growing group of pet-owning renters, and possibly, keep them for a longer period of time,” said Kotula. While nearly 65 percent of the pet owners surveyed said they live in a two bedroom apartment or larger, many indicated they were ambivalent to the size of their space when choosing a pet. In fact, more than 75 percent said the size of their apartment only played “some importance” to “no difference” when picking a pet. Cats rule when it comes to apartment pet choices, with a small dog in second place. About 20% choose large dogs, while a small percentage of renters prefer fish. Tenants still have to ante up for pet deposits, with $150 being a popular figure. As part of its What Renters Want series, Apartments.com surveys renters on various topics throughout the year. For more information on these surveys, to receive a copy of the results, or for an infographic with additional insights, contact Matt Miller at matt@salmonborre.com.